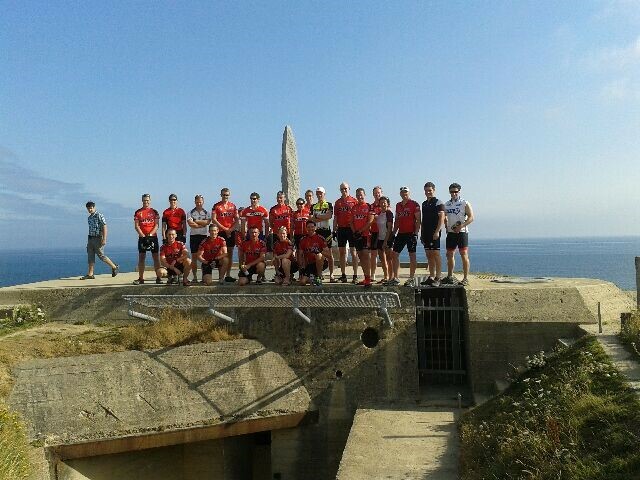 As part of a Battlefield tour to Normandy thirty five Royal Marine and Army officers took part in a sponsored cycle tour from Shrivenham Defence Academy to Bayeux in France and back. When deciding on the recipient charity to fundraise for, the ‘Bootnecks’ among the group were unanimous in suggesting JT’s foundation. George Little explained "I like the majority of the other Royal Marine officers doing the tour, was a Batch mate of JTs in the Royal Marine Young Officers 2004 batch. Having been in the same troop asJT during training, where his infectious enthusiasm and perennial optimism got me through many gruesome field exercises, I am delighted to see that his foundation is doing so well. With many of his old Batch mates assembled once again, we feel that it would be a very fitting tribute to support JT and his foundation." Exercise VELO OWL was organised by Majors Flash Gordon (Cdo Engineers), Guy Lock (Welsh Guards) and George Little (Royal Marines). The idea took shape, routes were planned and with training complete 35 cyclists and 2 support vehicles headed out of the Shrivenham Defence Academy’s gates. That one of the 3 groups of riders only made it to the bus stop outside camp before suffering their first puncture characterised their ride to Portsmouth, with 11 tubes being replaced over the course of the next 122km! With these hurdles overcome, the team freewheeled down the hill into Portsmouth and spent a night of luxurious comfort on the floor of the cross channel ferry. Their arrival in Caen heralded some beautifully smooth French roads, marred somewhat by the unpleasantly wet French weather. Luckily, the ride for the day was only 60km so they were able to dry out in time to meet the coaches for the start of the battlefield tour in Bayeux. Bikes gathered dust for the next 48 hours while they toured the highlights of Operations GOODWOOD and COBRA. Over this period the weather improved, providing some glorious sunshine for the next stage of the fundraising cycle. Having completed the formal battlefield tour, Thursday evening was devoted to some last minute bike maintenance and a good night's sleep before the return journey. Arrival back in the UK saw a midnight peddle through the drizzly streets of Poole to welcome accommodation and a much needed rest. Team VELO OWL then commenced their final leg back to Shrivenham. Despite some weary legs and some grueling climbs through Dorset and Wiltshire, the team completed the final leg of Exercise VELO OWL on schedule. Overall the team had covered some 450km through some beautiful English and French countryside and raised a fantastic £615.54 for the JTYAF along the way! Hoofing Effort! As JT would say.